I bought this Skin Food lemon pack some time ago and have been using it at least once a month, considering the varieties of mask that I have. You can click here to read about other mask that I have reviewed before. I have the tendency to buy masks and have trouble finishing them. Do you have the same problem? ha .. ha.. just want to know whether I am the only one with this bad habit. An exfoliating pack with vitamin rich lemon extracts promising a soft and smooth touch of the skin. Apply evenly on cleansed face with circular motion for 30 seconds. Leave it for 5 to 6 mins and rinse off with luke warm water. What I like about Skin Food Lemon pack? 1. It is easy to use. What I normally do is use it when I am in the shower. After cleansing my face, I scrub my face and pat dry followed by this mask. I'll continue to take my shower and by the time I finished my shower, it's time to wash off the mask! So, no excuse for too busy to apply mask ya. 2. It has the original lemon smell and I feel very fresh while using it. 3. After washing off the mask, my skin feels so smooth, bright and refreshed. Sorry, I forgot the price, maybe around RM40 for 100ml. 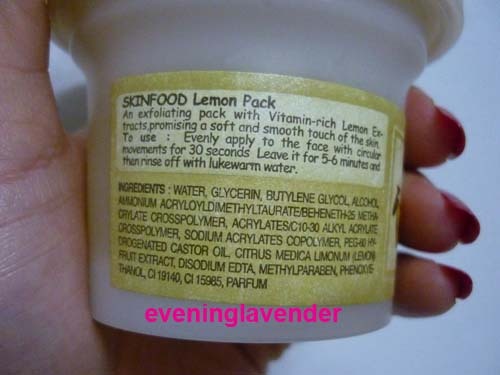 I would recommend Skin Food lemon pack to combination and oily skinned person. It does not dry my skin as the product contains glycerin.